Blog - Pre Season Mental Preparation - Happenings May 27, 2017- If you haven't been on the Deschutes in the last week or so, NOW is the time. Although the stoneflies showed up on time in early May, it took a while for the weather to warm up and get them flying. Last week brought some hot temps to the canyon and put the big bugs into flight mode, which finally stirred up some serious action with the fish. We are finally retiring the bobber rods for a while and even snipping the little dropper flies off of the big dry flies. Down and dirty, bow-and-arrow jungle fishing is the name of the game and we couldn't be more excited. This is when the biggest resident trout of our season show up to play. Give us a call and get down here! As much fun as the Deschutes Trout and Steelhead season is, and as rewarding( if slightly sadistic) as winter steelheading can be once it all comes together, the salt and the finned critters in the brine rip. I was so very fortunate to get a little island hopping and flats stalking to fill the soul before I have to go to work. Thanks to Thuy (super special thanks), Clay and some of other cast of characters from the Nervous Waters Crew. If you island bound, track Clay and Nervous Water down. the bones over there are not push overs, but instead of golf clubs and sunburns, take a day or two and give it a shot. More detailed report to follow. Still soaking up and marinading on the awesome trip like a tub of tako poke. For now here is a Clay's Paul Harvey of the events. catchin' up with clay and the crew. okay so i haven’t exactly been on it with the blogging... i’ve been busy (sort of). since the last blog there’s been a distinct move toward the happiness of summer in our waters. i’ve gotten some check in’s from around the nwff crew. as for me, in addition to the normal pound, i did a little island hop with thuy tran and mike boyd from the great state of oregon. thuy works at that other oregon university, which shall not be mention in this blog. mike is the owner/operator of deschutes river outfitters. if you are looking to get your trout or steelhead on, this is the guy to get in contact with. excellent fly fisher and a beyond cool guy (and you know i don’t say that about everyone). the three of us went on a little mission to kauai just to hang out and to see what was what out there. 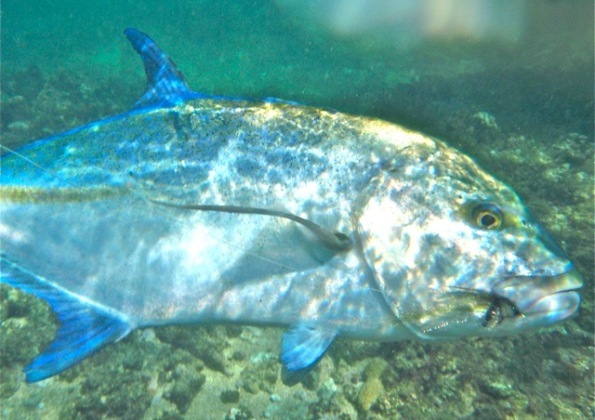 over the years, i have spent many days fishing for peacock bass on kauai but my experience in the salt there is limited. i scouted out some bones on kauai about ten years ago (with my buddies kevin, harry, and harold) and we got into some fish way back then. since then i never made it back to fly fish until this past week. 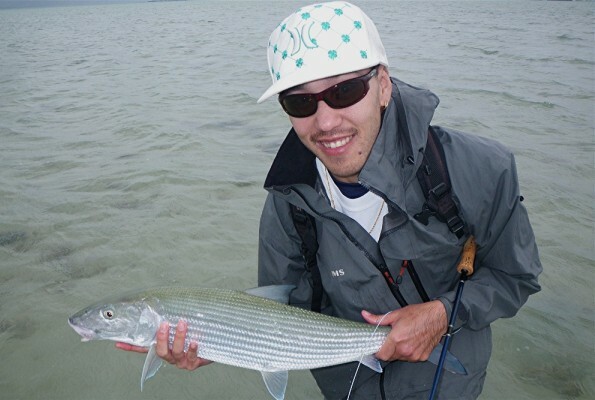 thuy has fished it with guide rob arita and has had success as well. this was mike's first time to hawaii ever. we started our journey with a couple of days here on oahu to get warmed up in the “known”. thuy had already hooked a number of bones with e.t. 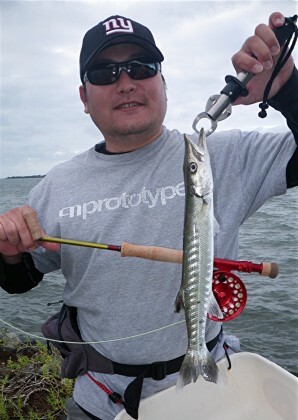 (guide ed tamai). she fished again with ed, while doug and i walked around showing mike the ropes (at least whatever ropes we two knuckleheads know). thuy got a nice seven pound bone. not surprising if you know bonefish and their affinity for her. 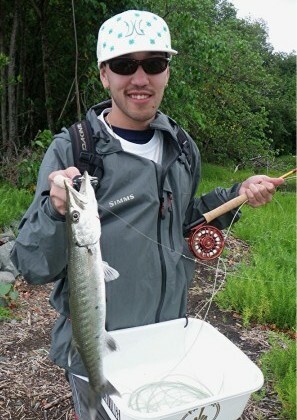 mike got a crash course in hawaii bonefishing and, being a good fly fisher already, picked it up quick. he managed to hook one as well and had that fish beat. the gods, however, had other plans and the fish broke off on a small piece of coral. we shrugged it off as just paying dues... sh_t happens. little did we know that would become a common theme through out our little journey. the next day thuy and mike gave it a go on their own and doug and i fished ourselves. the day turned out to be okay but the fish were picky at best. i managed to get a few little guys and before we knew it we were rushing (i mean rushing) to the airport and off to the garden isle. in the morning, mike went off in search of fish while thuy and i stuck together for a little garden isle bombarama. i didn’t really find any real prime bombing spots (the kind that i really like) but we fished some smaller cuts and channels and wouldn’t you know it, thuy hooks a rat. later we learned that mike had hooked a little omilu (bluefin trevally) and lost a bigger one that popped his tippet on the grab. the next day we checked out another area. i saw a bunch of bones and a few omilu but just couldn’t get bit. what can i say... sometimes like that. day three mike and thuy fished with guide rob arita and i poked around the reefs on my own. i saw a few bones but not many and again got the finger from all of them. 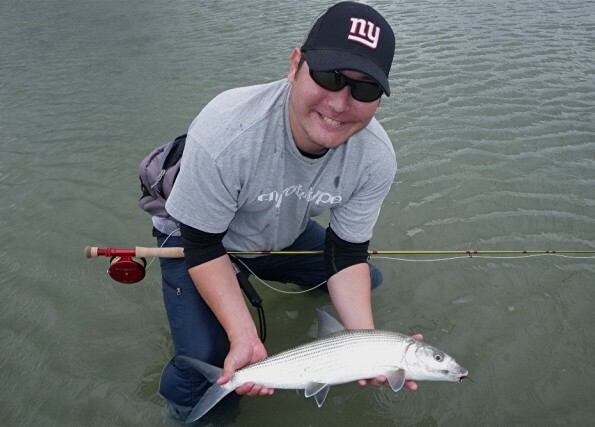 it was a stark reminder of how hard it is to go out on unfamiliar water and just start sticking fish. none the less, as deano would say, it is the journey. 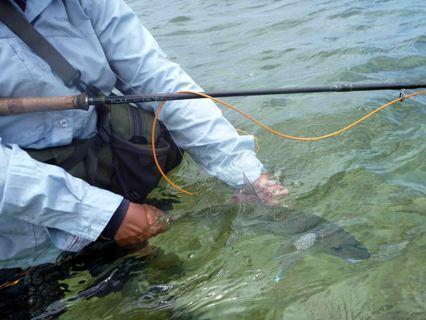 it is the kind of fishing i enjoy and the reason i began fly fishing on oahu some eighteen years ago. not because everyone was doing it, but because no one was doing it. 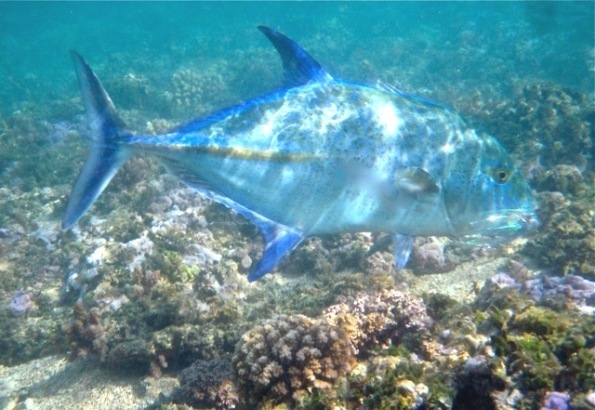 in the late afternoon i began seeing slow cruising omilu in super shallow water. i sight fished those guys... super fun. 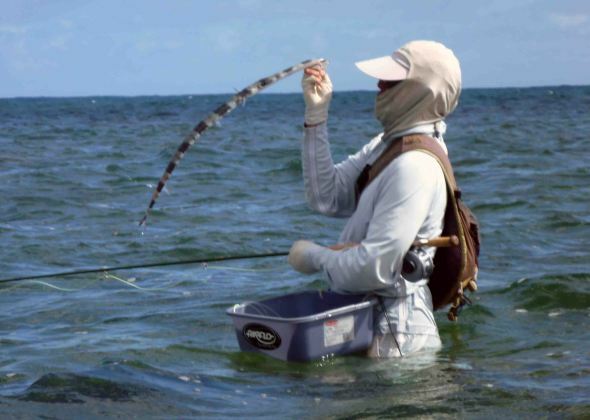 hooked a couple but the fly popped out when i laid the wood to them to keep them away from the numerous coral heads. 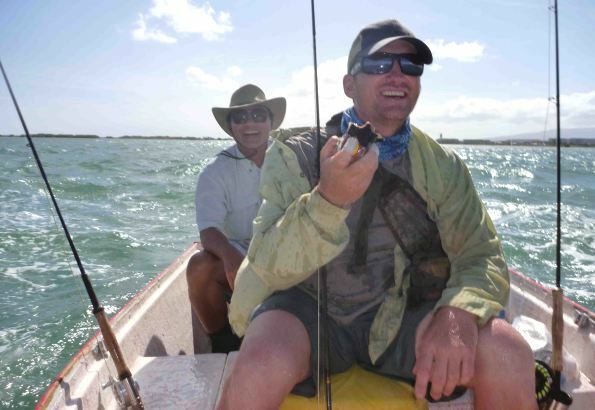 mike hooked a bone and a couple of omilu with rob, but again lost them all to mother reef. between mike and i we were at one small omilu and a handful of assorted reef fish. the next morning we decided to give it one last try. the last chance saloon. we had only a couple of hours to fish before we had to head to the airport and home. in that short time mike hooked four omilu and landed three of them. i was just as stoked as he was. first of all because this was mike’s last chance to fish hawaii until his return who knows when in the future (although i hope it is soon). secondly, i always love when the "just gotta pound" theory is once again proven to be true. 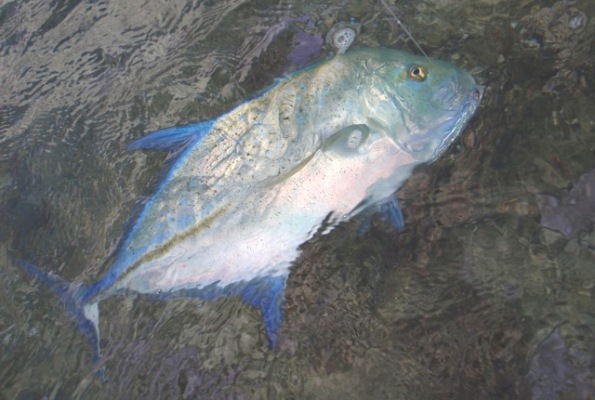 the kirksta checked in with this brute of an omilu (bluefin trevally). kirk says, "let the season begin!" sean and nankos mike checked in with a couple of windward side cudas. as well as a couple of bay bones. all caught with the sage smallmouth bass rod. mike gets his first taste of spam musubi... and it was off to kauai. thuy's two handed bone vid. a very ambitious to'au (black tail snapper). and everyone's pal the nunu (cornet fish). phew! this blog was quite a blogin' ordeal. i still haven't gotten thuy's go pro video and mike's pics so stay tuned. but at least now you're pretty caught up with clay. as always good fishing, good fish, and especially good friends. all a part of the journey for good times.